Take advantage of great features, keep track of your lifetime impact, and connect with others who give back. Donation minumum is $1.00 USD. Your total charge would be: $51.80 — Though GreatPositive takes 0% from donations, an unavoidable fee of 2.9% + $0.30 is deducted by payment processing companies. 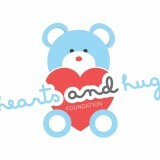 Choose this option if you'd like to ensure Hearts and Hugs Foundation Inc will receive the full amount you intend on giving.